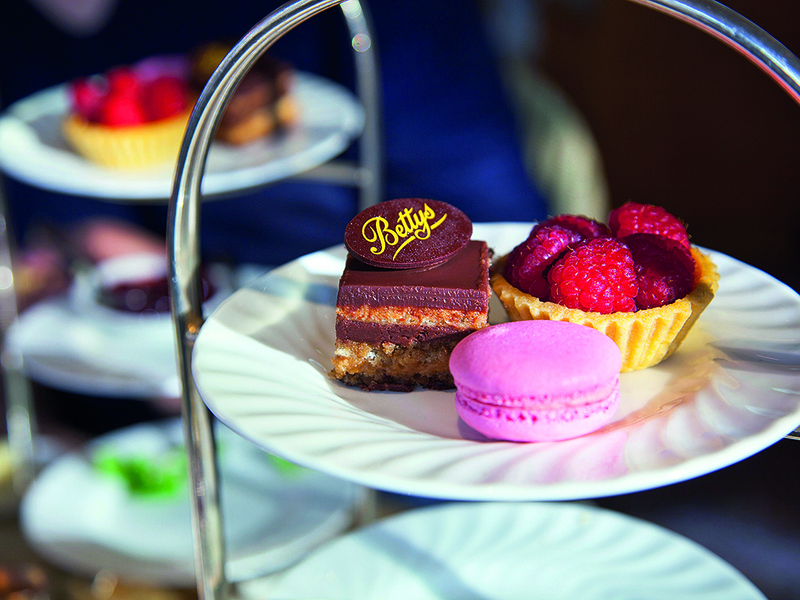 Ask anyone in the north of England to name a tasty afternoon tea and the chances are they will point you in the direction of Bettys. 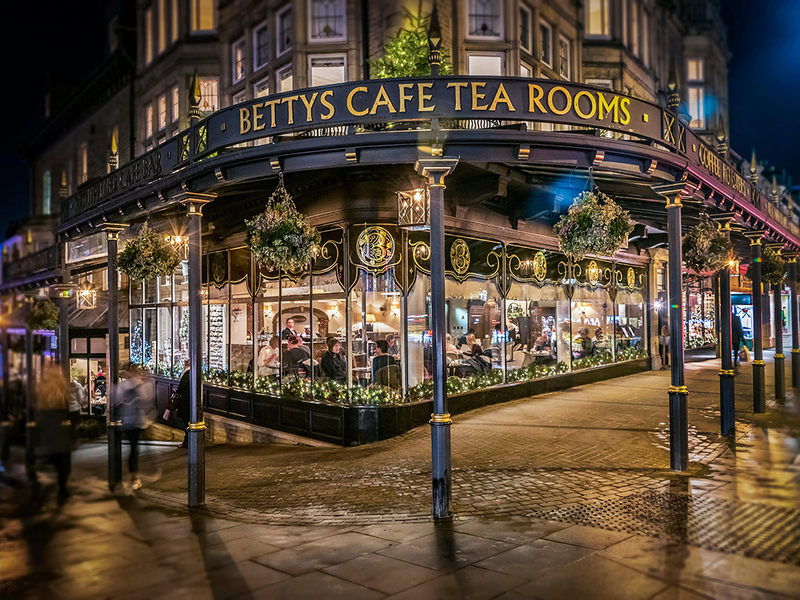 Now a Yorkshire institution with six tearooms, a craft bakery and a cookery school, the first café opened on Harrogate’s Cambridge Crescent back in 1919. Disappointingly, there is no real-life, cake-baking matriarch called Betty behind the empire, but rather a Swiss confectioner, Frederick Belmont, who only alighted here after boarding the wrong train. Such serendipity shouldn’t distract from the fact that Belmont put Harrogate on the culinary map. 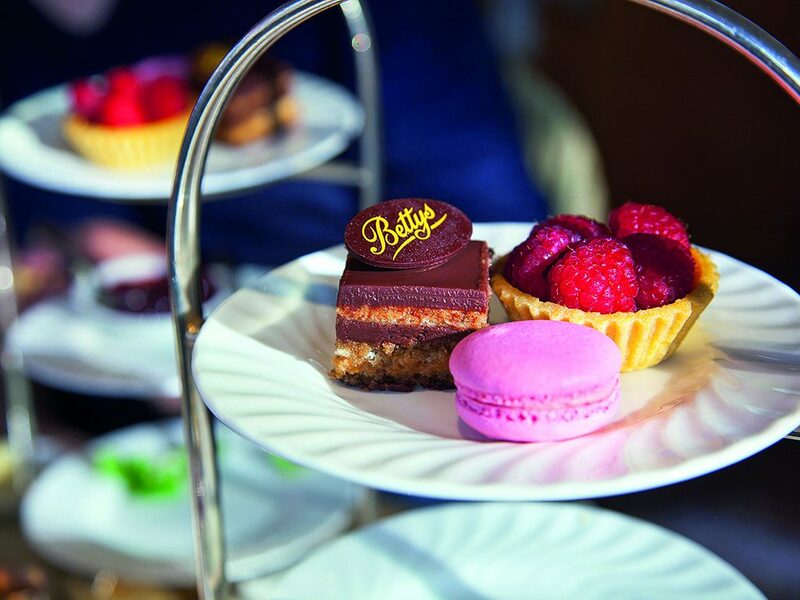 There are two Bettys Café Tea Rooms in the town today, the flagship on Parliament Street and a second at Royal Horticultural Society gardens at Harlow Carr. It is far from the only mouth-watering destination in the spa town. Fodder is the best place to start, a vast food hall and café backed by the Yorkshire Agricultural Society that sells all manner of locally- sourced farm produce, including 67 varieties of Yorkshire cheese. Elsewhere, Yorkshire Appetite lays on walking tours of the town’s Montpellier Quarter, a district of independent shops and eateries that includes vintage sweet shop Farrah’s, the gas-lit Victorian interiors of Hales Bar, and the Starlings Independent Beer and Coffee House. 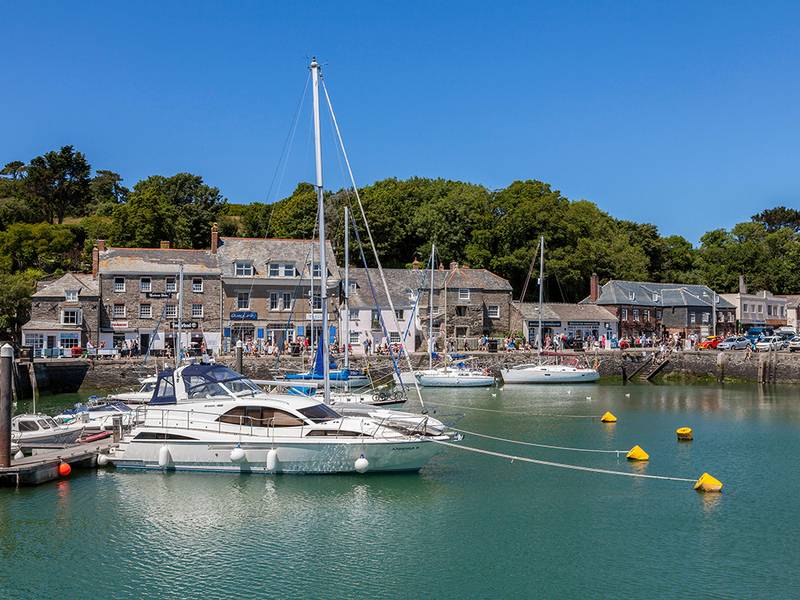 The bustling Cornwall fishing port of Padstow has long been a destination for foodies thanks to celebrity chef Rick Stein. He first set up The Seafood Restaurant here in 1975 after his attempts at running a mobile disco failed. Relying on his kitchen training at Paddington’s Great Western Hotel, the Oxford graduate prided himself on simple ingredients cooked well – a feature of his popular TV programmes that sampled food cultures from Spain and France to India and Mexico. Stein’s Padstow empire now includes a seafood bar, a fish-and-chip shop, a café, a cookery school, and St Petroc’s Bistro with the adjacent Ruby’s Bar. Far from saturating the market with his beef dripping-fried fish, Stein has succeeded in making this a year-round destination. Paul Ainsworth is the young pretender to Stein’s crown, after training under Gordon Ramsay in London and opening his popular Paul Ainsworth at No. 6 restaurant in Padstow back in 2006, which gained a Michelin star seven years later and mixes à la carte meat dishes alongside the more expected shellfish fare. He later took over the Mediterranean-influenced Rojano’s in the Square and then added the Padstow Townhouse boutique hotel with its to-die- for kitchen pantry. Those in search of something less formal but no less hearty and delicious should sample the ‘pub grub’ and local ales at the Old Custom House or The Shipwrights, both of which provide views over the River Camel estuary. Pity the casual tourist who walks into a Bakewell bakery and asks where their delicious pudding came from. 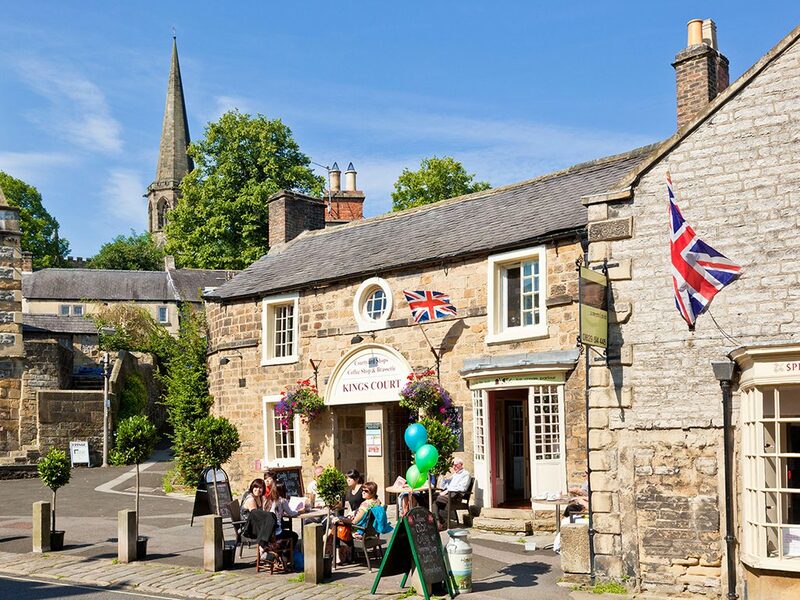 In this pretty Derbyshire market town, the origins of the local Bakewell pudding are hotly contested with at least three places claiming the original recipe. Since disputed, the cutest story has it that Mrs Graves, the landlady of the White Horse Inn (now the Rutland Arms Hotel), left a jam tart recipe for her hired help, who promptly spread the eggs and almond paste on top, rather than mixing it into the pastry. The resulting jam-and-almond flavour gave the pudding its distinctive twist; one that gained national fame as the mass-produced Cherry Bakewell by Mr Kipling. While Bloomers of Bakewell, The Old Original Bakewell Pudding Shop, and The Bakewell Tart Shop and Coffee House also make exceedingly good cakes, the town is more than just desserts. Wyes Water Tea Rooms offers a takeaway afternoon tea for picnickers, Chatsworth Farm Shop sells produce from the stately home (see issue 204), and Fischer’s in neighbouring Baslow boasts a Michelin star. 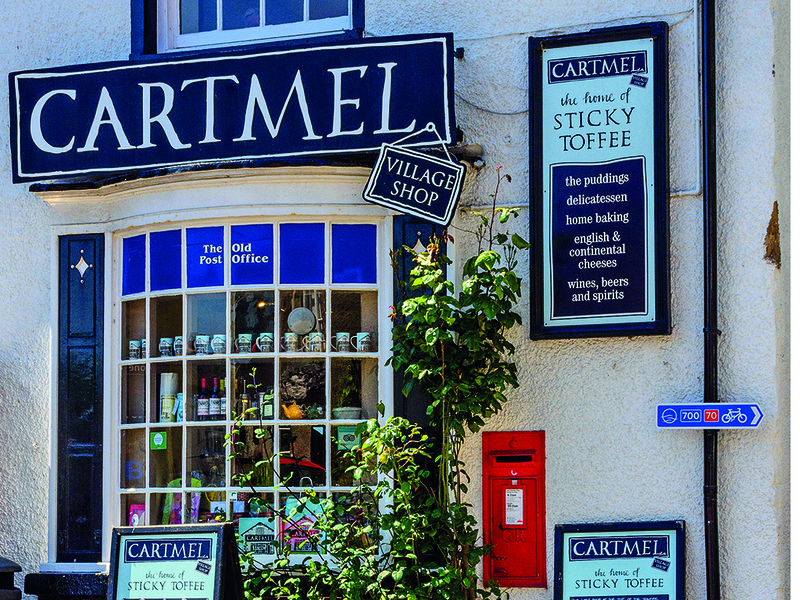 Though ostensibly in the Lake District in the northwest of England, Cartmel is actually closer to the beaches of Morecambe Bay than it is Lake Windermere and co.
A priory was established here in the 12th century, yet today most people make the pilgrimage here for chef Simon Rogan. His L’Enclume restaurant is set in an 800-year-old smithy and was awarded two Michelin stars in 2013. The 20-course tasting menu is filled with food as photogenic as it is tasty and relies heavily on produce grown on the restaurant’s own farm. You can also visit Rogan’s development kitchen Aulis or eat at the less formal Rogan & Co. Elsewhere, a regular food market, held on the third Friday of each month, is hosted in Unsworth’s Yard, which is also home to a number of artisan shops, including Cartmel Cheeses and the Unsworth’s Yard Brewery. 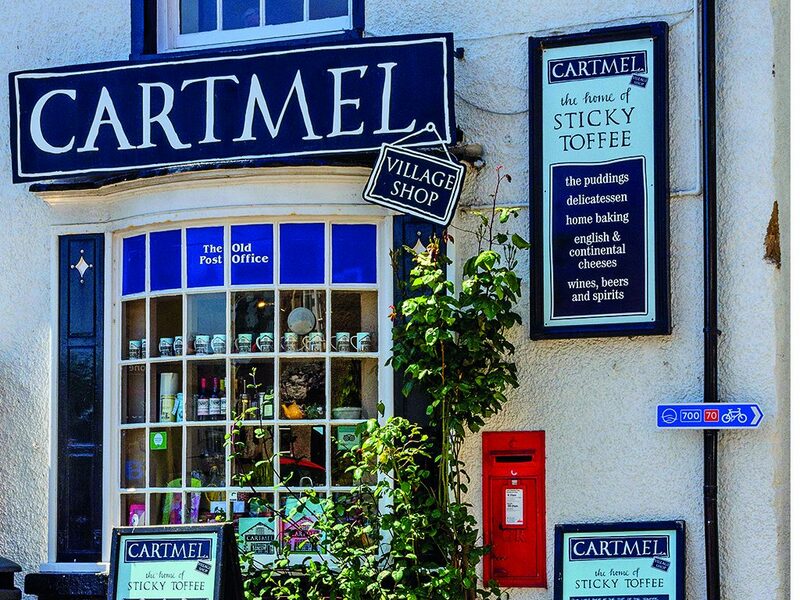 Even the local Village Shop gets in on the foodie action – it was here that the famous Cartmel Sticky Toffee Pudding was first created almost 30 years ago and now two million are sold each year. This self-proclaimed ‘food town’ near the Solway Firth boasts more than 50 independent food shops, cafés and restaurants. The sweet-toothed should head to King Street for artisan chocolatiers In House Chocolate by Design, and the Toffee Shop with its shelves stacked high with sweet jars. Earth’s Crust Bakery is famous for its sourdough bread, while the family-run Sulwath Brewery offers weekly tours of the premises and produces a tasty best bitter named after the local Criffel mountain. 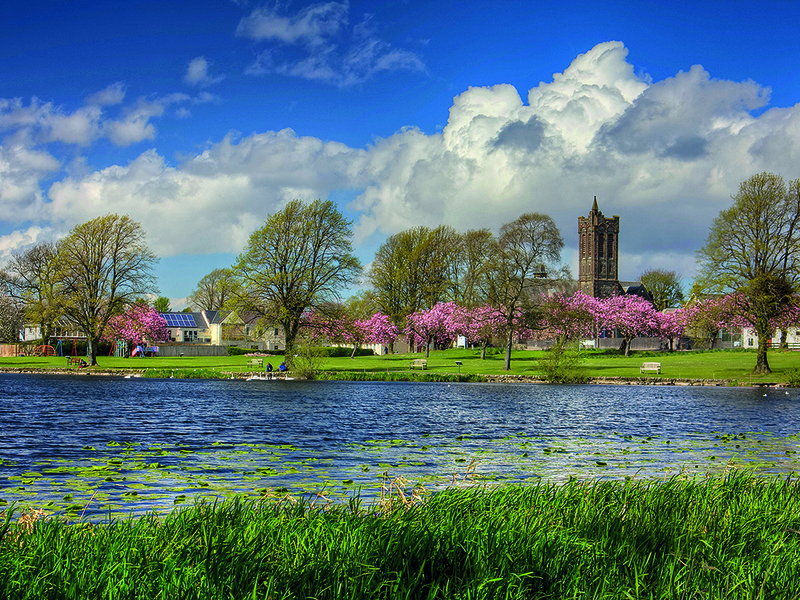 With regular food fairs and farmers markets too, one can stock up on local produce and head to Carlingwark Loch, a picturesque picnic spot at the bottom of King Street. Ludlow is a town that can soften the hardest of hearts. BBC presenter Jeremy Paxman, famed for his hard-hitting political interviews, once asked “Has there ever been a visitor to Ludlow who hasn’t wished they lived there?” Likewise, the late poet laureate and architecture critic Sir John Betjeman was a tough man to please, yet even he was once roused sufficiently to call it “probably the loveliest town in England”. Were Betjeman alive today, he would probably deem Ludlow the tastiest town in the country too. The Fish House on Market Street offers lunches of oysters, Whitby lobster and hot smoked trout, while you can sample six- and nine-course tasting menus at the Old Downton Lodge, a rustic restaurant with rooms, parts of which date back to the Norman Conquests. 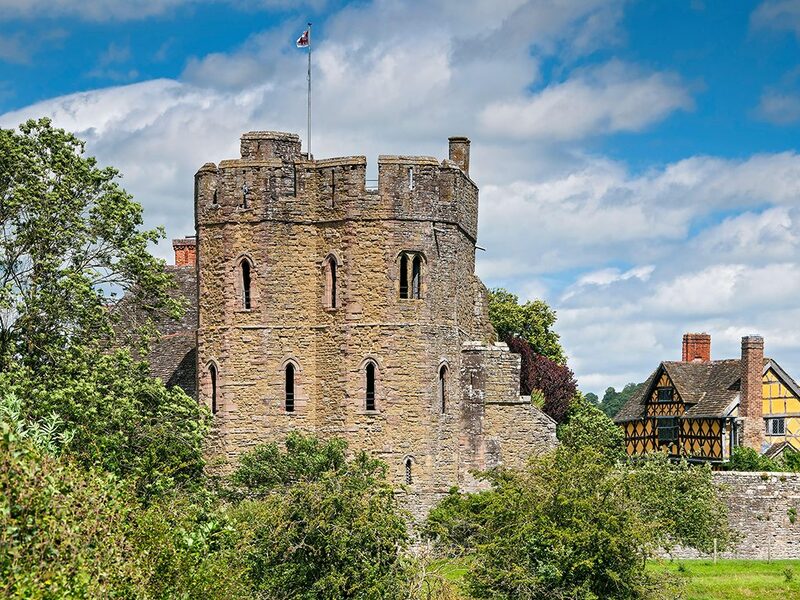 A series of annual festivals provide further reason to visit, from the Spring Festival in May that goes big on craft beers and fresh bread, to the September Food Festival that turns 25 next year and regularly welcomes more than 180 exhibitors from across the Welsh Marches. Prolong your stay at the Feathers Hotel, a gorgeous Jacobean building that celebrates its 400th anniversary in 2019. The black-and-white timber façade gave up on rigid geometry years ago, lending the whole place a natural charm that is continued inside via plush four-poster beds and a smart restaurant that offers modern takes on British classics like Packington pork and lamb chump (the equivalent cut to a beef rump). 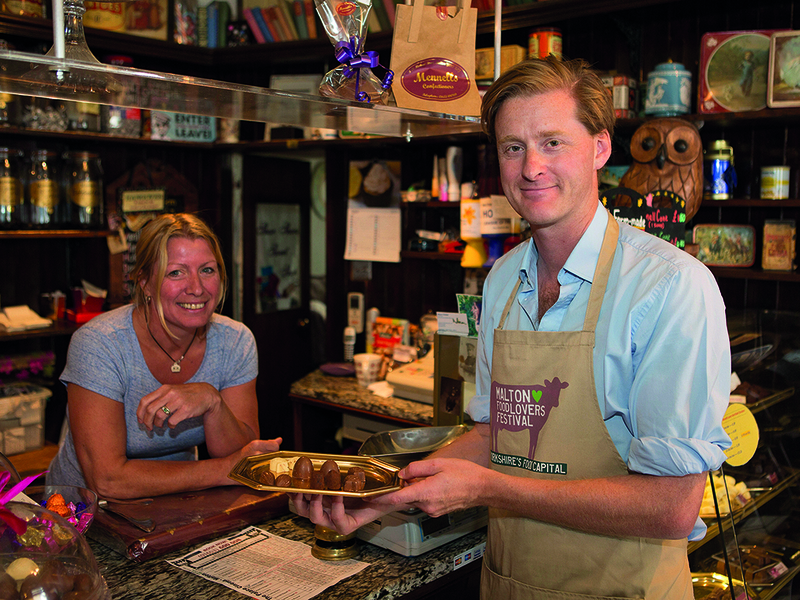 Suffolk styles itself as the foodie county, East England’s answer to your rumbling stomach. There’s a wealth of towns and villages that cater to gourmands here, from Aldeburgh’s vast Food & Drink Festival (29-30 September) and Southwold with its Adnams distillery and brewery tours, to the award-winning farmers’ markets at Lavenham and Bury St Edmunds. 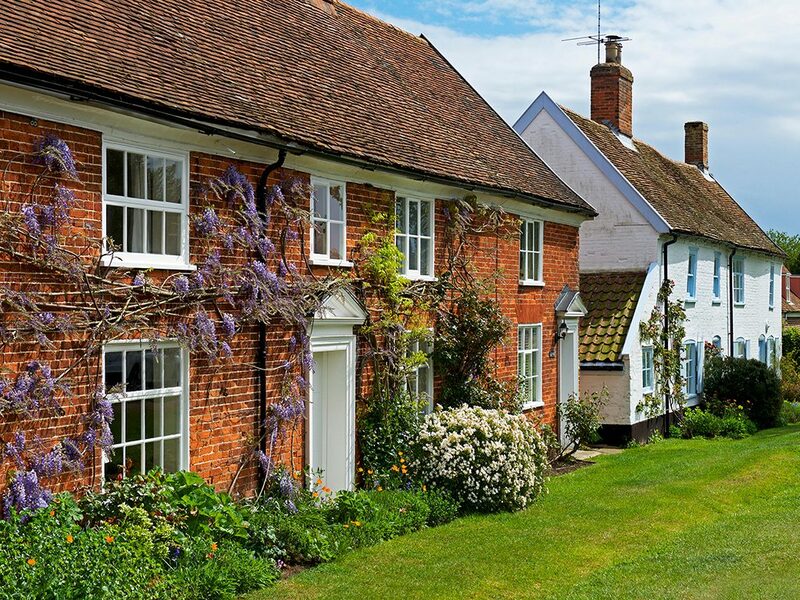 For sheer picturesque charm and options that far exceeds its village size, however, it is Orford that demands your attention. Set in a designated Area of Natural Beauty, the coastal village dates back to at least the 12th century when King Henry II ordered the unique polygonal castle be built here, which still survives in tact today under English Heritage care. The local landscape is equally distinctive. River Alde divides Orford from the thin wedge of Orford Ness National Nature Reserve and the English Channel beyond, while also accounting for the area’s predilection for excellent seafood. The family-run Butley Orford Oysterage restaurant is known countywide, not only for the juicy Butley oysters plucked from nearby beds, but also the range of fish that are smoked over whole oak logs in the smokehouses on Butley Creek. The Pinney family also runs a shop selling similar seafood that overlooks the Quay. The 1944-built Lady Florence cruise boat can be picked up here and allows up to 12 passengers to dine while bobbing along the Alde, while further up Quay Street sits The Jolly Sailor, a 400-year-old redbrick pub with a welcoming atmosphere. Extend a stay in Orford at The Crown and Castle, a smart, country-style restaurant with 21 bedrooms and a menu laden with local ingredients. If you find supermarkets a little soulless and yearn to visit a traditional butcher, baker and pie maker instead, Malton should top your destination list. The YO Bakehouse supplies the wider region as well as maintaining a café on Market Street, the family-run Costello’s makes award-winning steak pies, and Derek Fox butchers offers the fabulous ‘Yorkshire pot’ – various deboned game birds put inside one another and fit to feed a large extended family. For casual visitors, a food market takes place every second Saturday of the month with live cookery demonstrations, while the Talbot Yard food court provides a permanent home for six local producers and a cookery school inside an old redbrick coaching inn. Factor in the excellent restaurant at the Talbot Hotel and the Great British Food Festival at nearby stately home Castle Howard and it is little wonder that late great Italian chef Antonio Carluccio named Malton “Yorkshire’s food capital”.